One of the most frequent questions I’ve been asked over the years by new woodworkers is “Which should I buy first, a jointer or a thickness planer?” And the answer I always give is…it depends! Okay, I know that’s not actually an answer that would be helpful, but it DOES depend. It depends on quite a few factors that I won’t go into in this post, but I will tell you what I chose first and why. I decided to go with a Thickness Planer. Why? Because it was on sale at a price I knew would be a mistake to pass up. But that’s not the only reason! To make the big decision it’s important to understand what exactly each tool does. 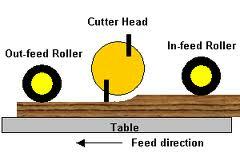 In a nutshell, a jointer is used to remove material at a specific depth in order to flatten one face or one edge of a board. A thickness planer is a tool used to remove material at a specific thickness on one side or edge so that it’s parallel with the other. They sound like very similar tasks don’t they? They are, but if you pay close attention to the description I provided you’ll see the key difference. Do you see it? It’s a small difference that has a huge effect. A jointer can give you a perfectly flat surface or edge, but if you were to flip the board over and attempt to joint the other side perfectly parallel and uniform in thickness to the first, you would have a very hard time achieving it. That’s not what a jointer is made to do. But a thickness planer is made just for that task. 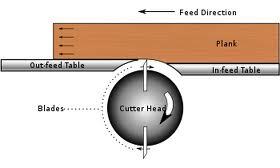 Because the thickness plane sandwiches the rough stock between the cutterhead and the table, it helps to guarantee the end result is an uniform thickness. Now the only problem is, if your board doesn’t have a flat face running across the table’s surface the board will still come out uniformly thicknessed, but it will also come out uniformly unflattened. In other words, if the face running across the table has a bow along it’s entire length, when it comes out the other end the board will be uniformly thicknessed but still bowed. You maybe saying to yourself “so I need to buy a jointer AND a thickness planer together…cool…more tools!” But your family might be saying “YOU’RE BUYING WHAT?? ?” Just know that I’m on your side, more tools are cool! But you can easily get away with just a thickness planer at first AND then buying a jointer later. See, unlike a jointer a thickness planer can be used successfully without for giving your flat and parallel faces all by itself with the help of a jig or two and maybe even a hand plane. But we’ll talk more about that in the next post. For even more great articles and links to information for “Get Woodworking Week” don’t forget to visit Tom Iovino’s website www.tomsworkbench.com all week long. Well said Matt! I made do for years with only a thickness planer. for flattening unruly board I used a flea merket #7 hand jointer I got for like $25. Jointing a board by hand is a MUCH less labor intensive process than thicknessing one!!! I’m sweating just thinking about it LOL. I wholeheartedly agree! Its not even close. 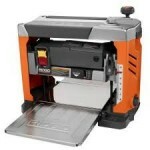 The TP performs a far more difficult and time-consuming task than does the jointer. 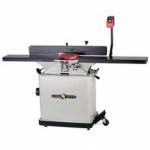 Furthermore, a very good TP such as the DW735 can be bought for far less than a similar quality jointer. For those who might be put off by the thought of jointing a board by hand, keep in mind that the surface need only be roughly flattened enough to not rock or bend on the TP bed. After the opposite face is cleaned up by the TP, the board is simply flipped to clean up the hand-jointed face. The board can be further thicknessed by repeated flipping. Also, hand planing the edges is not too hard either, and produces a better, more controlled result than any machine can. In this way, for fairly modest cost, a new woodworker can efficiently manage much wider stock than if he made the common mistake of buying one of those 6″ jointers. Thanks for revisiting this topic. I think it is essential for most novice woodworkers. Thanks for the link Rob, a great read! Good stuff Matt and is there any question why my thickness planer is one of the only power tools left in my shop. Because you can’t find an apprentice Alex won’t trip? That’s my attempt at a question. I purchased a planer first because this gave me the option to buy rough cut lumber and plane down to required thickness. To join two boards together I felt like I could use hand planer to struggle through and get a good fit. I felt like most times the table saw cut was good enough. I do have a jointer now and I’m really glad I do. Good topic Matt. I have been using thickness planer all throughout my life and I know you know my answer. But it is really a good topic to have a discussion. « IT’S FULLY FUNDED AND THEN SOME!! !